My name is Ryan and I am from Columbus, Ohio, but now live in Seattle, Washington. I moved to pursue a undergraduate education in microbiology and cell biology at the University of Washington and may one day pursue a PhD as well. This move gave me the good fortune to be within commuting distance to "American bonsai pioneer" Dan Robinson's famous Elandan Gardens. Although I have been practicing bonsai for many years, the rate at which I have learned about bonsai has exponentially grown once I started volunteering at the garden every weekend as sort of a part-time apprentice. My hope is that this blog will document and further that learning, my own growth, as well as the growth of my trees. I also hope you all will enjoy the trees of Dan's or my own that I am learning with and sharing in the process. Please feel free to share your opinions or critiques on any aspect of the blog or any tree in the comments of my posts! You can also contact me if you have inquiries you'd rather keep private. Here I am with my first yamadori (wild collected tree). 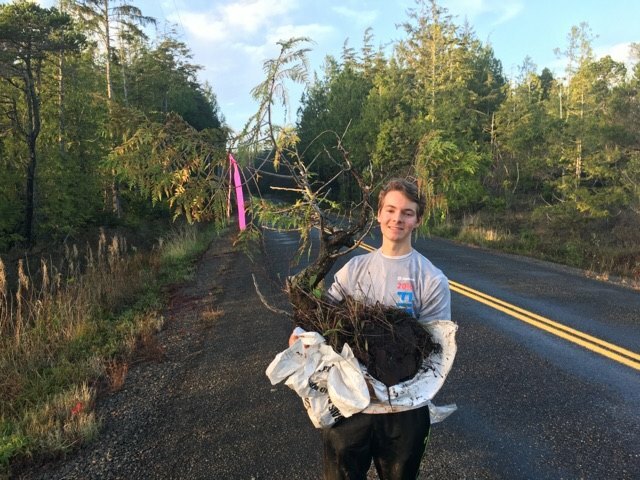 Through my knowledge of biology and Dan's experience, I hope to build on Dan's success in transplanting and cultivating great wild trees into bonsai. "Living Art-fully! It’s in Our Nature"
"The Fruits of Our Labor"